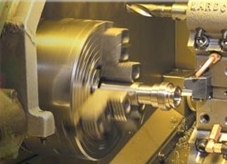 Machining is any process in which a piece of raw material is cut into a desired final shape and size by a controlled material-removal process. These controlled material removal processes are today collectively known as subtractive manufacturing, which differs from processes of controlled material addition, which are known as additive manufacturing. Exactly what the “controlled” part of the definition implies can vary, but it almost always implies the use of machine tools (in addition to just power tools and hand tools).